Our devs have been hard at work and listening to feedback from the store and facebook groups. Update 1.1.0.0 is hot off the press and just been submitted for publishing ( July 1st 2015). It contains the following cool new stuff! A Dark Theme option. This is useful for complex wallpapers with lots of high contrast edges, it can dramatically improve the separation between the background and foreground. It also helps with battery life. Drop Shadows option. The life scores now have the option of a subtle drop shadow, again to improve background/foreground separation. Some people like the original “Metro” design look so this option is also retained as the default. Ad Removal upgrade option. Some reviews on the store requested there was an option to remove ads so this is now included. Finally, this website has been integrated into the app so is available by a single touch. 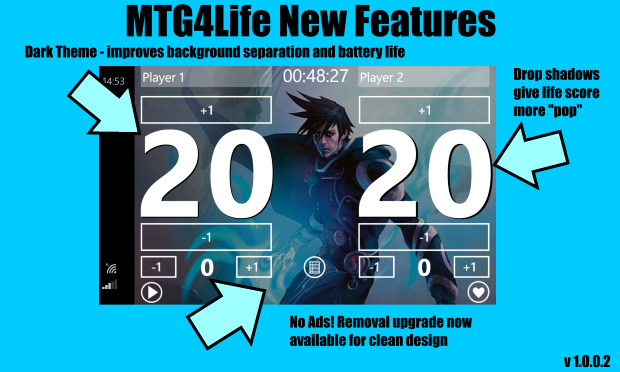 Check out all these features in the customisation hub “Pimp my MTG4Life” by touching the heart button in the bottom right of the app.